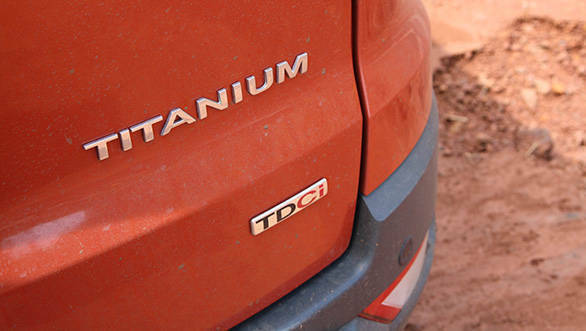 Is the EcoSport diesel as revolutionary as the petrol? Not really, this in fact is the same engine seen under the hood of the Fiesta. However, this family of common-rail engines is similar to the units used internationally. The 1.5-litre turbocharged unit puts out 90PS and 204Nm of torque. While the petrol features never seen before technologies in this segment, the diesel features similar technology to what is already available in the market. 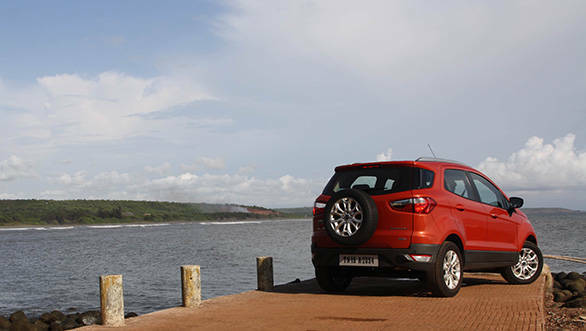 But that will not stop it from being the highest selling variant in the EcoSport range. How does it feel in the real world? Press the start button and the engine comes to life in a smooth fashion and revs quickly for a diesel. On the move, the NVH levels are very impressive. The engine is refined and pleasantly torquey. The five speed gearbox is also lifted off the Fiesta and like in most Fords, the shifts are enjoyably slick with short throws. The clutch feels perfectly weighted with a progressive feel. However, it would have been nice if Ford could have extracted some more power from this motor. Power delivery is linear but we would liked a stronger surge. The gear ratios are well spread out but there is evident turbo lag below 1700rpm. Once on the move, mid range and top end power is sufficient making it a capable highway tourer, the car comfortably cruises at speeds of up to 140kmph and maxes out at an indicated 165kmph. When it comes to handling, the added weight of the diesel engine has had a small impact on driving dynamics but can only be felt when pushed hard. However, we strongly believe that it still is the best handling diesel SUV in this price bracket. Driving in town is effortless thanks to the light clutch and steering. 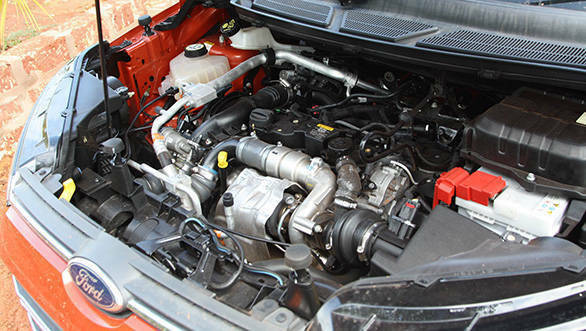 While outright power isn't this engine's strongpoint, fuel efficiency is. During our drive that included both highway, urban and ghat sections the EcoSport averaged a very decent 13.5kmpl with the air con on full blast. The ARAI claimed number is a high 22.7kmpl. We couldn't test the car and only a full test in the July issue of OVERDRIVE will have the complete test numbers. 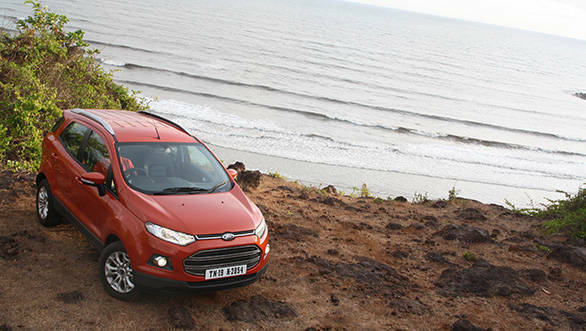 So does it make more sense to buy the EcoSport diesel over the petrol? It only makes sense to buy the diesel if you cover really long distances and go out on frequent long drives. The EcoBoost is equally torquey while producing much more power and also promises good fuel efficiency if driven with a light foot. And if you live in Goa where we drove both cars, petrol definitely is a smarter buy because diesel actually costs more than petrol here! If only the rest followed Goa's example. We expect top end pricing for both the diesel and EcoBoost models to be similar and we personally feel the EcoBoost is a better driving experience, suiting the car's sporty and compact character. The only advantage the diesel may have is when it comes to variant options since the EcoBoost is only available in top two variants. We'd personally have the EcoBoost any day of the week.